Latest NIELIT Faculty Recruitment 2017 Notification issued. 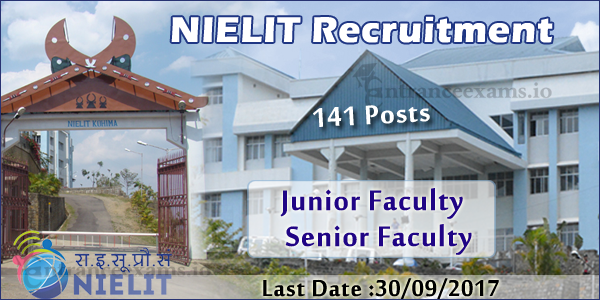 Apply online for 141 Junior & Senior Faculty Jobs in NEILIT Chandigarh. Check the NIELIT Vacancy 2017 Eligibility before applying. Refer the National Institute of Electronics and Information Technology Notification 2017 @ nielit.gov.in. Know more details of NIELIT Recruitment 2017 such as Selection Process, Pay Scale, and others from the below sections. Good News!!! The National Institute of Electronics & Information Technology, Chandigarh advertised the NIELIT Faculty Jobs 2017 Notification. Ths issuance of this Employment News is to fill the 141 Junior & Senior Faculty Vacancies. So, we hope that the aspirants who are searching for the Teaching Jobs can utilize this opportunity. To apply for the NIELIT Chandigarh Recruitment 2017, candidates should satisfy the eligibility criteria as per the rules of the organization. As per the official Notification, aspirants should complete B.E/B.Tech/Diploma in Electronics/ Electronics & Electricals/ Electronics & Instrumentation. And, the candidates whose age between 21 to 48 years are allowed to participate in the NIELIT Recruitment 2017. We provide all the other details of the National Institute of Electronics & Information Technology Notification here. So, insight the below sections. For Senior Faculty Posts: Aspirants must possess B.E/B.Tech in Electronics & Electricals/Electronics/ Electronics & Instrumentation. For Junior Faculty Posts: Candidates have to complete 3 Years Diploma Course in Electronics/ Electronics & Instrumentation/Electronics & Electricals. Else, Diploma in Repair of Electronic Appliances and Maintenance. Maximum Age – 48 years. Aspirants will be selected on the basis of their score in the following rounds. For Senior Faculty Jobs: Rs.25000/-. For Junior Faculty Posts: Rs.15000/-. The General and OBC applicants have to pay Rs. 350/-. And, there will no fee for the SC/ST/Ex-serv/PWD candidates. Starting date to apply online: 5th August 2017. End date to submit online application: 30th September 2017. How to Apply Online for 141 Teaching Faculty Vacancy in NIELIT Chandigarh? Firstly, visit nielit.gov.in/chandigarh, the official website of NIELIT Chandigarh. Open the official notification available on the home page. Refer the notification carefully for checking your eligibility. Then, click on the NIELIT Recruitment 2017 Apply Online link. Now, fill the Chandigarh Faculty Recruitment NIELIT Online Application Form. Cross verify the details once before registration. Then, make payment as per your category. Finally, take the hard print of the application form for future reference. NIELIT Recruitment 2017 Notification was published for 340 Scientist ‘B’, Scientific/Technical Assistant ‘A’ Posts. Interested candidates can check their Eligibility for NIELIT Jobs 2017 at nielit.gov.in. And, eligible contenders can apply to Nielit Delhi Scientist Recruitment 2017 before 28th August 2017. Check out other information like Application procedure, Selection Process, Pay Scale for the National Institute of Electronics & Information Technology Jobs. We come back with Latest Employment News released by the National Institute of Electronics and Information Technology. The NIELIT Delhi has published the Recruitment Advertisement for the 340 Vacancies. As per this notification, the Scientist ‘B’ and Scientific/Technical Assistant ‘A’ posts are vacant. So, Aspirants who seek for Govt Jobs in Delhi can use this best chance in order to get a job. Interested contenders can apply to the NIELIT Vacancy 2017 before 28th August 2017. Also, aspirants should check the Educational Qualification, Age limit to check their eligibility for the NIELIT Jobs 2017. If you eligible for the MeitY Scientific/Technical Assistant Vacancies 2017, you can apply online at official website neilit.gov.in. We have posted all the necessary information regarding the NIELIT Scientist & Technical Assistant Recruitment 2017 here. So, we wish the aspirants to read this complete page for other information like selection process, application fee, etc. Every aspirant should check their Eligibility for the NIELIT Jobs 2017. The Eligibility includes the Educational Qualification, Age Limitation that are required for the National Institute of Electronics & Information Technology. Aspirants who completed BE/B.Tech in CSE, IT, ECE, Electronics & Telecommunication. Or, M.Sc (Physics, Electronics /Applied Electronics) with one year of relevant experience are eligible for the MeitY Vacancies 2017. Applicants should have passed M.Sc./MCA/MS/B.E/B.Tech in any one of the below fields. Field (Single/Combination): Physics, Electronics, Computer and networking security, Applied Mathematics, Statistics, Applied Electronics, Information Technology, Computer Science, Computational linguistics, ECE, Electronics and Telecommunications, Management, Informatics, Software System, Computer Management, Remote Sensing, Bio-informatics, GIS, Mathematics, Operations Research, Mechanical, Civil, Information Science, Electrical, Design. Applicants Age must not exceed 30 Years. Check the official MeitY Notification 2017 for the upper age relaxation. As per the recruitment process of MeitY, the applied individuals will be selected on the basis of their performance in the following rounds. Scientist ‘B’: Rs.56100 – 177500. Scientific/Technical Assistant ‘A’: Rs.35400 – 112400. To General & OBC applicants, the Application Fee is – Rs.800/-. To Other aspirants (SC/ST/PWD/Wome), there is no Application Fee. Contenders who have an interest in applying online for the NIELIT 2017 Recruitment must fill the online applications directly at neilit.gov.in. The Board will accept the online applications that were sent between 28th July 2017 to 28th August 2017. And, no application will be accepted after this last date. Follow the below steps to apply online for the NIELIT Scientist & Technical Assistant Jobs 2017. How to Apply Online for MeitY Group A, Group B Jobs 2017? First of all, log on to the National Institute of Electronics and Information Technology careers page i.e., www.apply-delhi.nielit.gov.in. Open the Official Advertisement of NIELIT Scientist ‘B’ Recruitment 2017 on the home page. Read this notification carefully and check your eligibility. If you satisfy the eligibility conditions, click on the Apply Online link. Now, fill all the necessary details in the NIELIT Recruitment 2017 Online Application Form. After filling, ensure the provided details correct or not. Then, submit those details to proceed to the payment section. After paying the application fee, download and take a hard copy of the NIELIT Application Form 2017. Our entranceexams.io team will post further information of the NIELIT Recruitment 2017 here very soon. Therefore, stay tuned with this page for the New updates. Also, leave your queries about the MeitY Jobs 2017 in the comment box available below. Our team will quickly reach your comments and can provide answers. Please send recent updates accordingly.